The complexities of integration has led some to classify “best of breed” as a passing fad. Having a system that already tightly integrates your Order Management System (OMS), Customer Service, Warehouse Management System (WMS), A/R, A/P, Marketing and Email campaigns, and especially your eCommerce, is more valuable than previously thought. These enterprise-level systems have definitely come of age, minimizing the need for so many critical integrations and allowing you to focus on the integrations that are truly necessary areas of system specialization. In more than three decades, the biggest mistake we see companies make is to not create an action plan that covers all aspects of the implementation. When it comes to B2B integration, here are three simple things to consider when planning your ERP implementation. Any time you are dealing with third parties / additional software interfaces, this often introduces unexpected obstacles and delays from simple things, such as point of contact vacation schedules, to mapping mismatches due to terminology misunderstandings, to more complex issues, such as errors in an integration partner’s API documentation. Allocate resources to integrate with any business partners you have (shippers, payment gateways, trading partners, etc.). Schedule these activities during the planning stages to avoid delays, unexpected expenses, and customer service issues. Consider any new partners and service providers that are not part of your current processes before implementation. With all the new processes, training, data conversion, and other activities, they could easily be overlooked if they’re not included in your implementation plan. When planning your implementation schedule, keep in mind the schedules of your service providers. If they need to make any adjustments, test, or assist in any way, they may also need time that could cause your schedule to be adjusted. 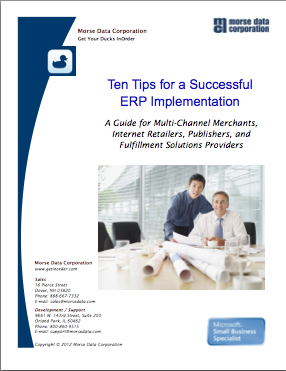 For more valuable information about Implementing your ERP system, download our “Ten Tips for a Successful ERP Implementation” paper. Whether you’re considering a new ERP system or you’re just beginning an implementation, this paper will help you keep your implementation within budget and on time. Morse Data Corp. works with several business partners to increase your productivity and help you keep your customers happy. One of these partners is Endicia. Endicia is the leading provider of e-commerce shipping technologies and services. By integrating Endicia with InOrder, you have access to Endicia’s certified U.S. Postal Service solutions. Whether you are a high-volume warehouse shipper, operating an e-commerce site from a garage, or simply trying to get invoices out before the day is over, Endicia can help save time, reduce costs, and increase productivity. Endicia is one of many of Morse Data’s partners. InOrder is a real-time, tightly integrated, single database ERP system for multi-channel merchants, Internet retails, publishers, and fulfillment solutions providers. You can read some of our reviews here. To find out more about integrating InOrder with any of these solutions, give us a call. Resolutions aren’t just promises you make to yourself. With InOrder, resolutions handle complex relationships using a set of parameters. They represent exceptions to your standard rules and override other related settings. You can set up rules to derive a value based on any criteria supported by programming. … then add supporting fields to select the criteria to use – in this case, specifying the inventory items that cannot be shipped to the specific countries. A column is created for each of your criteria fields and the output value. By configuring various permutations of your criteria fields, you may specify unique output values that will be resolved when those criteria are met. You may also specify a default or “catch-all” case for criteria by choosing *ALL* for any cases that do not meet a specific case. When a Resolution is evaluated, the entries are checked for a match from the top down. The first match found sends an output value to the window being used. This allows you to set up any derivation hierarchy that you require, providing the columns that you wish to evaluate are available in your resolution definition. When an order is placed for these products to these countries, it is automatically canceled with a notification message. Contact us for more information about using Resolutions with InOrder. With the explosion of the use of mobile devices, it is only logical that eCommerce businesses use it to their advantage and lead traffic to their eCommerce websites. Here are ways embracing mobile technology can help you stay competitive. People often use their mobile phones to look for stores in the area, or to get directions from their location. This is a great opportunity to lead them to your website with a link from your listing. Use a mobile app to notify subscribers of your specials, offer coupons, and even offer details about products they viewed. Apps can be more unique than text messages in what they provide. You can use apps to work with other marketing campaigns, personalized offers, and social media efforts. Coupons and special offers that are available only through your app can help you track the usefulness of these efforts. Text messages don’t require a special app to use and are simple to send. Here are several good ways to use text messaging to attract customers to your web store. Use text messages to confirm orders, relay order shipping and delivery status. Send links to customers requesting reviews of products they recently purchased. Coupons and Flash Sales – Text messaging is an interesting way to offer special coupons or flash sales just for customers and text subscribers, as well as offers that are not available on your website. Exclusive messages can keep customers interested in your messages and make them feel special. Keep your messages brief and on topic. Be clear about who you are, the benefits of acting, and by when. How often it’s appropriate to make contact is determined by your business. When you use text messaging, be careful not to overwhelm your subscribers with too many messages. And always provide a link to your web store.